What a fabulous picture book! 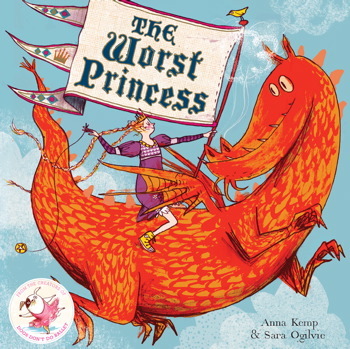 The Worst Princess by Anna Kemp and Sara Ogilvie is the story of Princess Sue, who follows all the rules. She expects that once her prince arrives, her world will be full of excitement. Unfortunately, he has different ideas. and you wear dresses, are we clear? Just smile a lot and twist your curls. "What a disaster, my prince is a twit!" Then in the skies she suddenly spied...."
And so, with a little help from an unlikely companion, Princess Sue takes her life into her own hands so that she can have the adventure she craves. I must own a copy it sounds like fun! I have been reading this book to the primary groups at our school this week. It's just been so much fun. My favorite comment was, "I like this kind of princess" When this kid is a bit older I am going to introduce him to The Princess Academy by Shannon Hale.